Though essential to the Christian faith, the Old Testament remains an enigma to many. Some view it as disjointed and difficult to understand, or as nothing more than a collection of archaic documents that are irrelevant for Christians today. 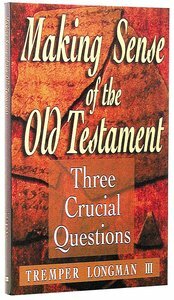 In clear and concise language, Tremper Longman addresses three questions to help resolve this problem: What are the keys to understanding the Old Testament? Is the God of the Old Testament also the God of the New Testament? and How is the Christian to apply the Old Testament to life? 160 pages, from Baker. About "Making Sense of the Old Testament (Three Crucial Questions Series)"
A noted biblical scholar explores three questions Christians often ask about the Old Testament and provides answers that are both satisfying and understandable. Christians often face a number of obstacles to their understanding of the Old Testament, including differences in culture, worldviews, traditions, language, and geography. Longman provides practical principles for achieving a fuller understanding of what the Old Testament says. He looks at each section of the Old Testament--law, history, poetry, wisdom, and prophecy--and explains the issues involved in applying that section to Christian life today. Scripture and subject indexes are included. Tremper Longman III (Ph.D., Yale University) is Robert H. Gundry Professor of Biblical Studies at Westmont College in Santa Barbara, California. He is also Visiting Professor of Old Testament at Mars Hill Graduate School, Westminster Theological Seminary and adjunct at Fuller Theological Seminary. He is the author of commentaries on The Book of Job and Proverbs (Baker Commentary on the Old Testament Wisdom and Psalms); Exodus (The Two Horizons Old Testament Commentary) and Jeremiah, Lamentations (New International Biblical Commentary), Daniel (New Internatuional Version Application Commentary), Ecclesiastes and Song of Songs (New International Commentary on the Old Testament/ Cornerstone Commentary). Longman is the author of How to Read Genesis; How to Read the Psalms; How to Read Proverbs; How to Read Exodus and Literary Approaches to Biblical Interpretation, and co-editor of A Complete Literary Guide to the Bible and co-author with Dan Allender of Bold Love, Cry of the Soul, Intimate Allies; The Intimate Mystery and The Intimate Marriage Bible Studies. 1	what Are The Keys To Understanding The Old Testament? 2	is The God Of The Old Testament Also The God Of The New Testament? 3	how Is The Christian To Apply The Old Testament To Life? A noted biblical scholar explores three questions Christians often ask about the Old Testament and provides answers that are both satisfying and understandable. Christians often face a number of obstacles to their understanding of the Old Testament, including differences in culture, worldviews, traditions, language, and geography. Longman provides practical principles for achieving a fuller understanding of what the Old Testament says. The doctrine of the Trinity has much to teach us about the essence of God as well as our relationship with one another. This book demonstrates the biblical foundation, logic, and importance of the Trinity. Erickson illustrates various historical teachings and compares them with what the Bible says on the subject. 108 pages, from Baker.